What began in Basel, Switzerland in the 1970s as an art fair hosted by three gallerists has become the place to be — and be seen — each December in Miami. Since 2005, designers, architects, celebrities, and fashionistas have been flocking south to Design Miami held at the Miami Beach Convention Center and various satellite locations across the city and its beaches. 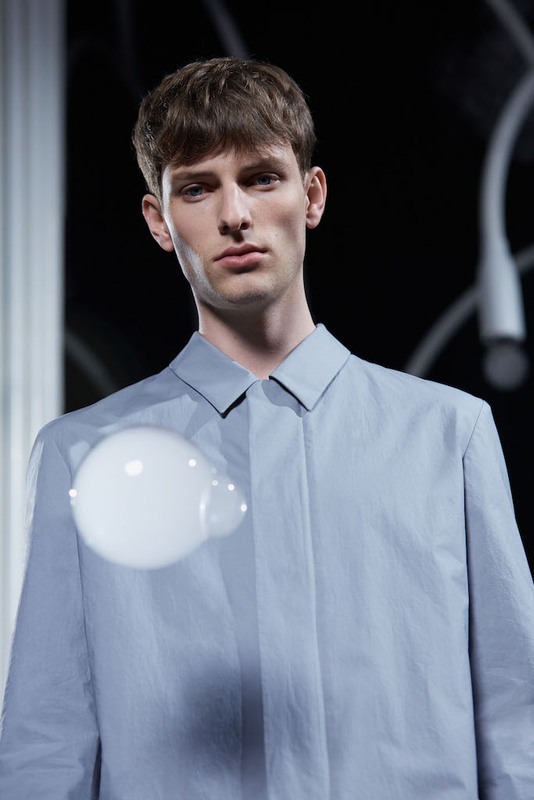 Younger sibling to Art Basel, the weeklong design event hosts top product designers and studios from around the world alongside their latest and most innovative wares; these days, often coupled with technology. Despite the main venue’s ongoing $615 million renovation (unveiling 2018) and a surprise end-of-summer bash (otherwise known as Hurricane Irma), the show went on with 34 exhibitors from nine countries exhibiting to thousands of event-goers (over 38,000 visits total). 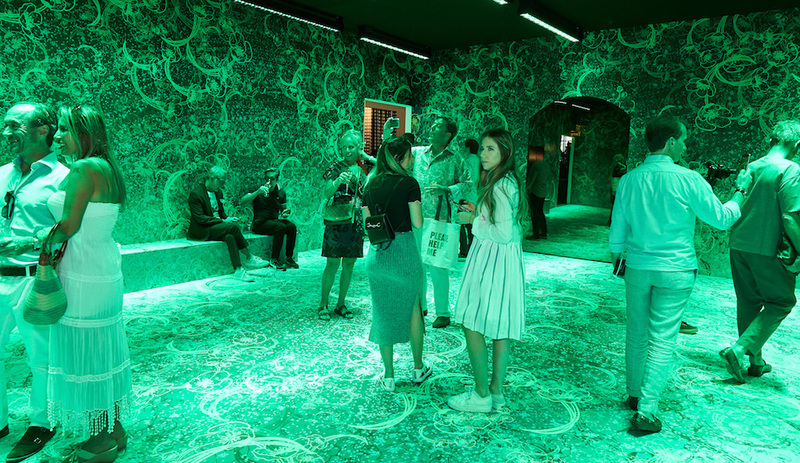 Attendees included the likes of Konstantin Grcic (Design Miami’s 2010 Designer of the Year), Norman Foster, Humberto Campana, Rafael de Cárdenas, and Leonardo DiCaprio — the actor’s foundation is collaborating with artists to raise awareness around climate change. 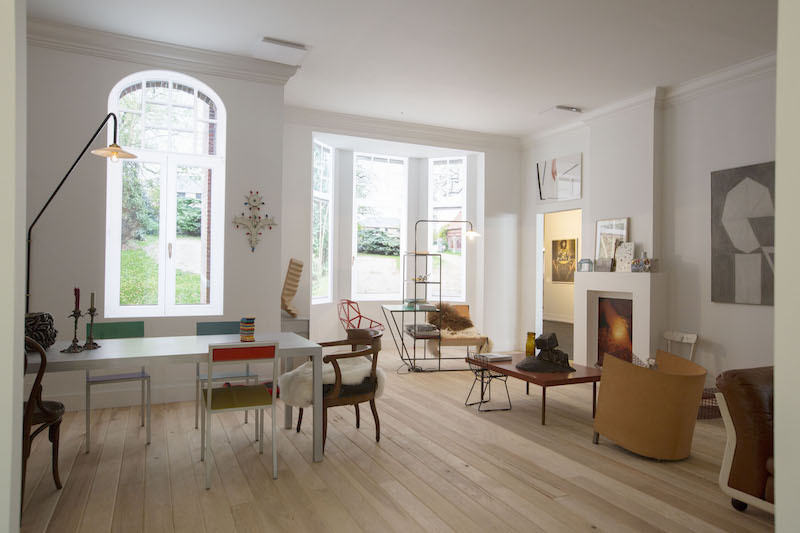 Belgian artists Fien Muller and Hannes Van Severen offered the ‘home away from home’ experience by exporting their living room in Ghent to the Design Miani show floor. A contrast of high design and sentimental keepsakes, the installation — commissioned by San Francisco hospitality platform Airbnb — featured interactive lightboxes with recorded scenes from the couple’s living room windows plus ambient sounds of the fireplace and the family dinner table. A painting by Van Severen’s grandfather (artist Dan Van Severen) and a chair made by the couple’s daughter, intermingled with sculptures, artwork, and books, transported guests to the Belgium home for a highly-immersive environment. For the complete experience, the house is available for temporary stays via Airbnb. Beneath the double-height ceilings of historic art deco Temple House, Studio Swine — comprising Japanese architect Azusa Murakami and British artist Alexander Groves — in partnership with minimalist Swedish clothing brand COS, erected an all-white, tree-like structure that emitted mist-filled blossoms, bursting and evaporating upon contact with skin, but ‘living’ momentarily when met with textured fabrics (gloves were provided to visitors upon entry). On the rooftop, the design studio created an inflatable cloud-shaped sculpture that floated in the pool of a partially-shaded terrace, complete with patio furniture for lounging. 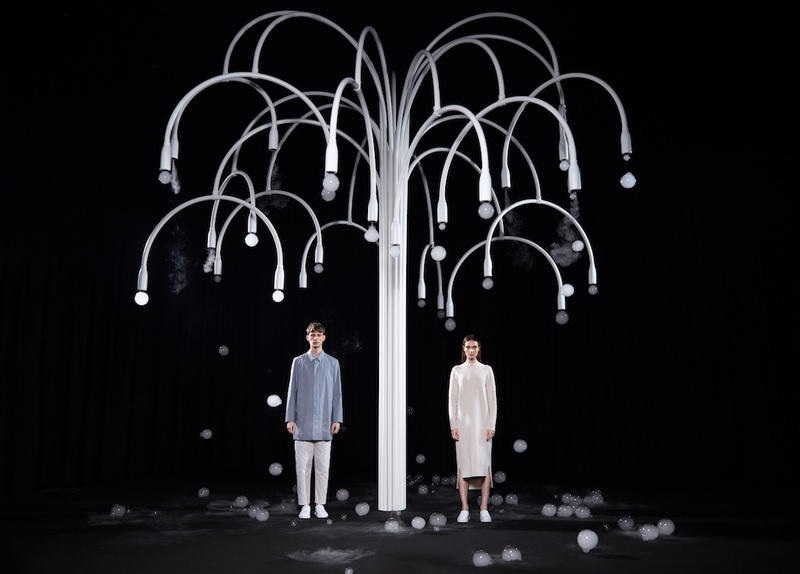 Originally presented at iSalone in Milan earlier this year, the tubular bubble-blowing machine was adapted for Design Miami by scenting the mist to result in bursts of fragrance referencing the Florida Everglades. 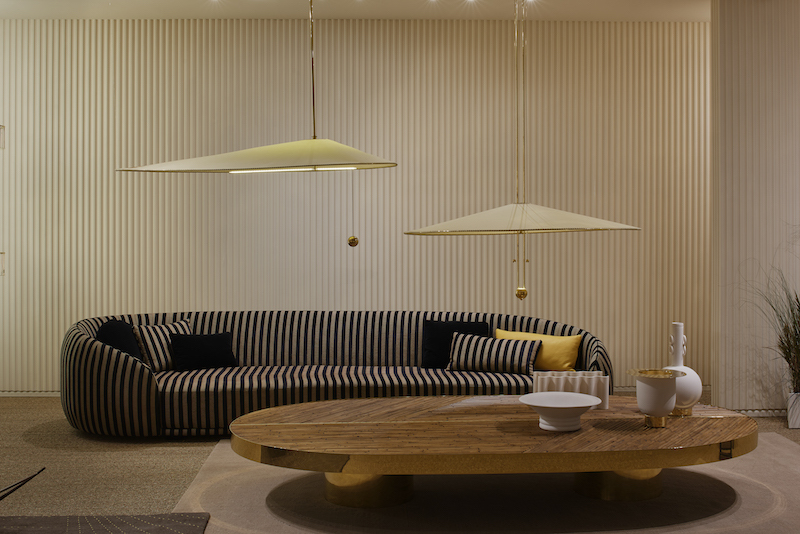 ‘Good living’ was the optimistic theme of Fendi’s tenth exhibit for Design Miami. Devised by Milan designer Chiara Andreatti — who has collaborated with the likes of Boffi, Glas Italia, and CC Tapis — the luxurious yet low-key living space played homage to the Italian fashion house’s most iconic patterns and materials like Cuoio Romano leather, the Selleria stitch, or the black and tobacco-striped sofa that recalled the brand’s 1970s shopper. Mixed with earthier pieces such as bamboo coffee tables echoing the slanted lines of Fendi forms and woven raw hemp-backed thrones that harkened back to primeval times, the result was a welcoming rustic environment punctuated by refined elements, and vice versa. Louis Vuitton returned to the fair with its ever-expanding and limited-edition Objets Nomades (aka ‘Art of Travel’) collection that included collaborations with star designers Marcel Wanders, Campana Brothers, Atelier Oï, Patricia Urquiola, India Mahdavi, and Nendo. 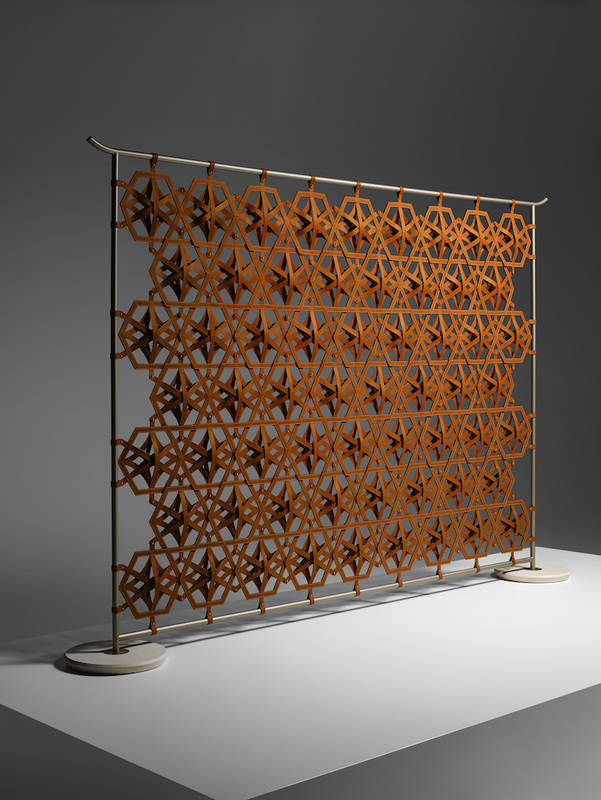 Wanders, inspired by the 163-year-old French fashion house’s classic monogram pattern and the canework once used in its steamer trunks, created an intricate, semi-transparent leather screen — available in any size — that can be suspended across its metal frame or hung from a ceiling. 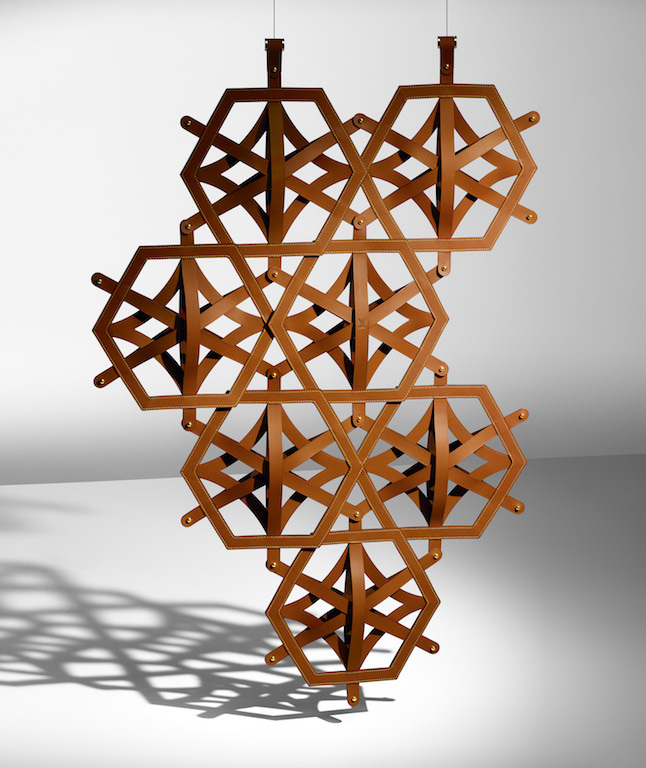 Each part is connected to its neighbour via brass clasps, similar to those found on Louis Vuitton bags. Showgoers who headed for the Design District — to visit the Institute of Contemporary Art’s shiny new home or to simply peruse the high-end shops — likely would have encountered a curious yet familiar intervention along the Paseo Ponti walkway. 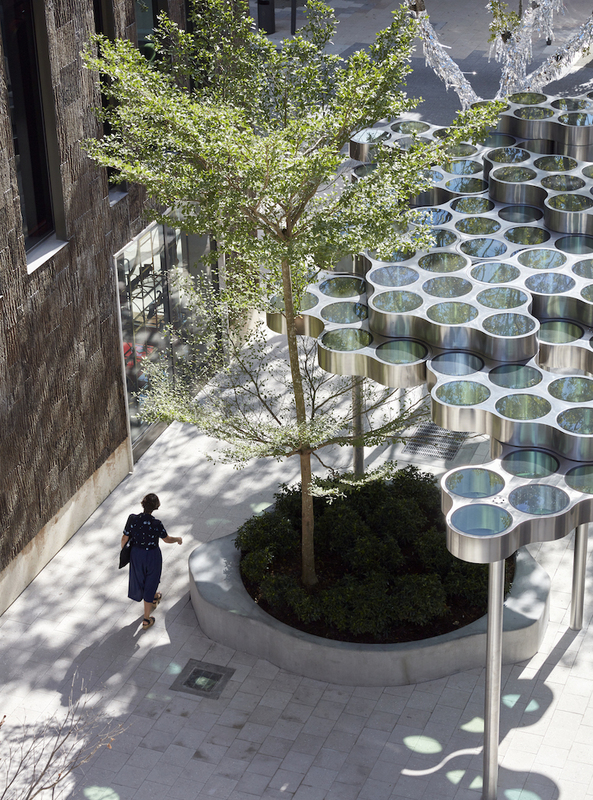 The Bouroullecs’ organic pergola — which takes its shape from their Vitra vase ‘Nuage’ (meaning ‘cloud’) — is composed of stainless steel and coloured glass that casts blue and green shadows along the path like the stained-glass windows of a cathedral. Measuring 100 metres in length, the permanent shelter invites visitors to relax and reflect, and forms part of a larger landscaping plan incorporating plants, ponds, and concrete seating. 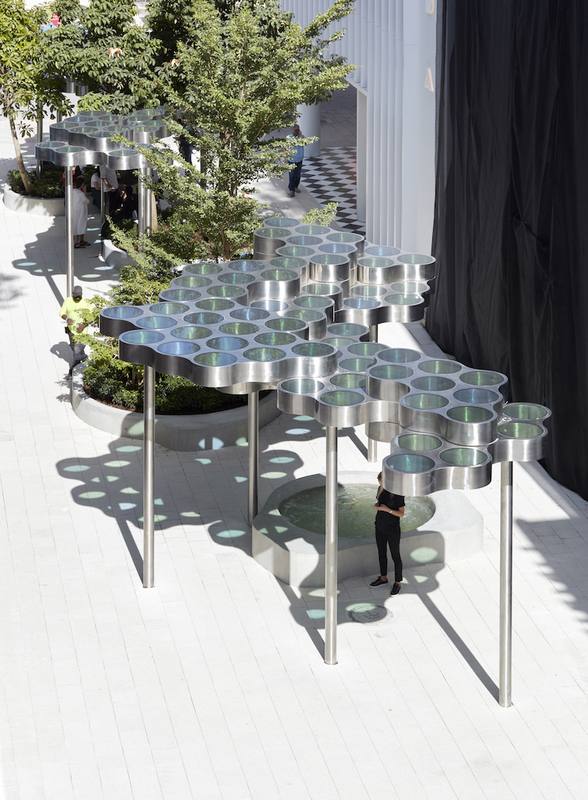 Thanks to a collaboration with Perrier-Jouët, designers Petra Bachmaier and Sean Gallero of Luftwerk could be found at three different locations across the city, including Miami International Airport. The Chicago-based studio — invited to tap the storied champagne house’s Art Nouveau bottle artwork to inspire a contemporary installation — went digital with changing coloured lights projected onto intricate and fanciful floral patterns printed across fabric walls and floors, flooding the room in a different jewel tone every few seconds. 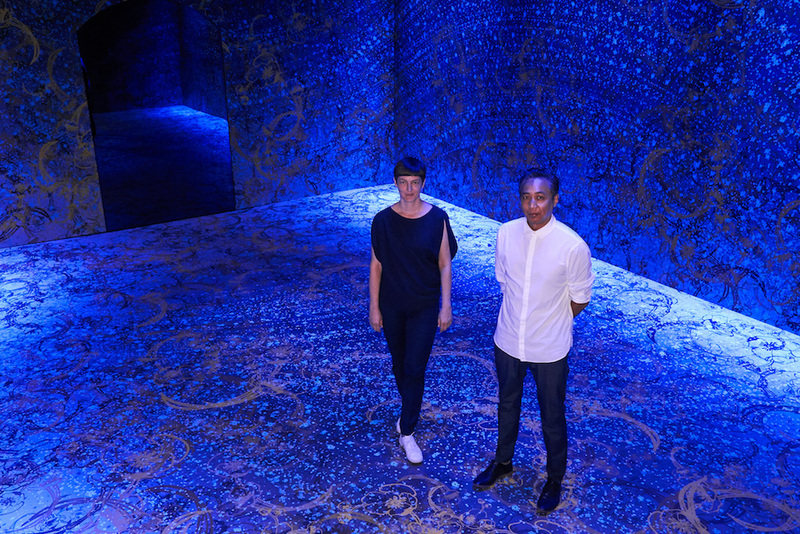 The eye-catching exhibit, with its seemingly kinetic tapestries, was a selfie hotspot at this year’s Design Miami.